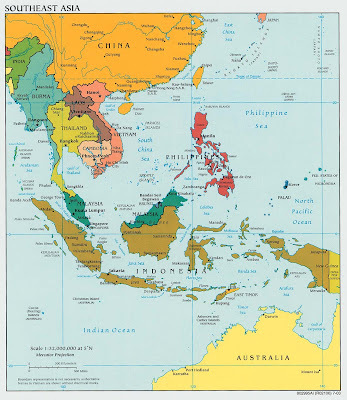 First off, most of the information in this blog was researched from Lonely Planet's Southeast Asia on a shoestring. This book is referenced on the left of this blog in the "Our guide books" link list. Here's a map to better understand the locations as they are discussed. This map is referenced on the left of this blog in the "Related Maps" link list. Laura and I are traveling one-way to Bangkok, Thailand on November 14, 2007. Our itinerary has us going from Burlington, VT to New York, NY (1.35 hours), then New York, NY to Abu Dhabi, United Arab Emirates (12.35 hours), then Abu Dhabi, U.A.E. to Bangkok, Thailand (5.5 hours). We'll leave Vermont at 6:10 AM (Eastern time) on November 14 and we'll arrive in Bangkok at 6:45 PM (Bangkok time) on November 15. We are staying our first 7 nights at the Lamphu House in Bangkok. In Bangkok, we have decided to get the Japanese encephalitis vaccine. The vaccine is no longer in production in the United States. Since we plan to be in a number of national parks, we thought it prudent to get this vaccine. The vaccination comes in 3 doses. The first dose is given on Day 0, the second on day 7, and the third on day 30. This forces us to stay in the Bangkok area for 30 days to obtain the vaccine. During the first seven days, we will visit Bangkok. As with most cities, lots of action will be at the markets. We plan to visit Chatuchak market, the mother of all markets, with everything from chickens and snakes to handicrafts and antiques. I'm sure we'll find great food during our market visits. We will visit the Damnoen Saduak floating market, where goods are sold from wooden canoes by Thai women. Both Laura and I plan to take classes in Bangkok or Chang Mai. Laura wants to take Thai cooking courses, something I will benefit from greatly. I plan to take Thai boxing courses, hoping that my nose is straight by the time I am done. Finally, we'll visit the various temples and hoods of Bangkok. Once we've received our second shot, we'll head south to the beaches. Ko Tao, a mountainous island surrounded by coral reefs, will provide us with excellent snorkeling and the potential to get a diving license. Khao Sok National Park is a rain forest with swimming holes surrounded by limestone cliffs. Ko Phi Phi, although loaded with tourists, has jaw-dropping limestone cliffs and translucent water. Finally, Ko Tarutao National Marine Park is a gorgeous island park far from the tourist crowds. We'll see as much of it as we can and probably enjoy side trips along the way. We'll return to Bangkok for our final shot and then begin our journey to the mountainous north of Thailand. We'll begin with Khao Yai National Park, with over 50 km of trails, most formed by wildlife. We'll continue to Chiang Mai, Thailand, a square-shaped city surrounded by medieval-style walls and moats. The city is a tourist center, providing a night bazaar, trekking to Thai hill tribes, classes on meditation, massage, cooking, boxing, etc. We plan to visit at least one hill tribe during our journey. It could be in Chiang Mai, Laos or Vietnam. We'll visit Wat Phra That Doi Suthep, one of northern Thailand's most sacred temples. From Chiang Mai, we'll head towards Loei, a base for visiting more remote areas of Thailand. Highlighting the area is Phu Kradueng National Park containing a large mountain with unhindered views. We'll cross the northeastern Thai border to Vientiane, Laos. Here's a Thailand map summary of the trip. Vientiane, Laos is along the Mekong river. It is home to a number of interesting Buddhist temples, museums, an Arc de Triomphe replica, and Buddha park, a park full of Buddhist and Hindu sculptures. In Laos, I'll have to be especially careful to avoid “beer shops”, where a pint of draft is often followed by an appointment with a friendly lady. From Vientiane, we'll travel north to Luang Prabang, a city of French colonial architecture, Buddhist wats, and green mountains. Photography, shopping, and great food will be the focus of our visit. Around Luang Prabang, we'll visit Tat Kuang Si, a multi-tiered waterfall containing a swimming hole. Muang Ngoi Neua, a nearby town, offers fishing and trekking trips in Northern Laos; a good opportunity to see the hill tribes of Laos. We'll leave northern Laos to the southern Four thousand islands, where the Mekong fans out and numerous sand bars have formed. Fishermen and water wildlife are abound and Don Khong is a great place to see wild Irrawaddy dolphins, fresh-water dolphins. Here's a Laos map summary of the trip. We'll cross into northeastern Cambodia and head to the capital of the Ratanakiri province, Ban Lung. Taking a dip in Boeng Yeak Laom, a volcanic crater lake, and visiting waterfalls Chaa Ong and Ka Tieng (Ka Tieng has Tarzan vines to swing on!) are a must. Hiking is a popular option in Ban Lung. From Ban Lung, we will head south to Sen Monorom, the capital of the Mondulkiri province. This is an excellent place to rent a motorbike and explore nearby waterfalls like Bou Sraa Falls, one of the largest in Cambodia. From Sen Monoram, we'll head west to Kratie. If we missed the Irrawaddy dolphins in Laos, this is another opportunity to view them. We'll continue to Kampong Cham and from there, go west to Siem Reap, the gateway city to the temples of Angkor, one of the main reasons for doing this trip. Highlighting all of the magnificent temples is Angkor Wat, a spectacular temple. We'll spend a week in Angkor exploring all of the temples. From Siem Reap, we may take a boat to Battambang, Cambodia's second largest city . Battambang is a riverside city surrounded by rural temples with the best-preserved French architecture. Phnom Penh, the capital city of Cambodia, is our next stop. We'll get educated at the phenomenal Tuol Sleng Museum, once a school that was turned into a prison during the Khmer Rouge rule. Most all at the prison were taken to the Choeung Ek killing fields, which we intend to visit. From Phnom Penh, we will visit Bokor National Park, home to cool climate, tigers, elephants, mountains, and an abandoned French Hill station. Here's a Cambodia map summary of the trip. Phnom Penh will be our final stop in Cambodia. 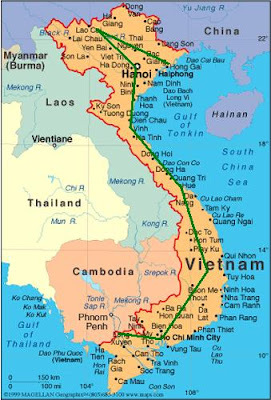 We will head east to Ho Chi Minh city (Saigon) in southern Vietnam. Unfortunately, as of this posting, I'm behind on my Vietnam research so not much to say. 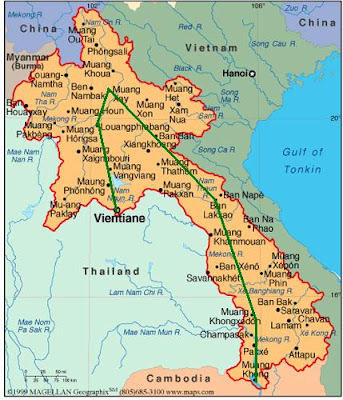 We'll head north to eventually arrive in Hanoi and possibly Sa Pa. Here's a Vietnam map summary of the trip. From there, finances and energy will determine whether it is time to return to the USA or time to visit China or India! What a fantastic trip plan. I'm ready to follow each of your steps with the great stuff you provide. Boy the blog has evolved quite magnificently. I might say. As Katharine Hepburn would have said. May the force and God's oversight be with you. The " hunting ... Greg"